Emerico, a world leader in banking and retail technology, unveiled its latest technological innovation, R35 Self-Service Robot at the World Islamic Banking Conference 2018 (WIBC), which opened its door in Manama, Bahrain, today (November 26). The WIBC, the longest and largest Islamic Banking conference, is back in Bahrain, the Islamic financial hub of the Mena region, to celebrate its 25th edition at the Art Rotana Hotel and Resort which runs till November 28. The R35 is the latest addition to Emerico’s line of products which aims to further assist customers in all service-oriented industries. Emerico is an ISO9001 company with eight international awards and accolades in the field of banking and customer service solutions. It operates in three continents with four regional offices. The R35 is produced as an endeavour to further redefine and improve the customer experience, focusing on providing a more seamless process for various customer-centric tasks. As a result, it is highly customizable to suit the needs of businesses from any customer-centric industries, said a statement from the company. 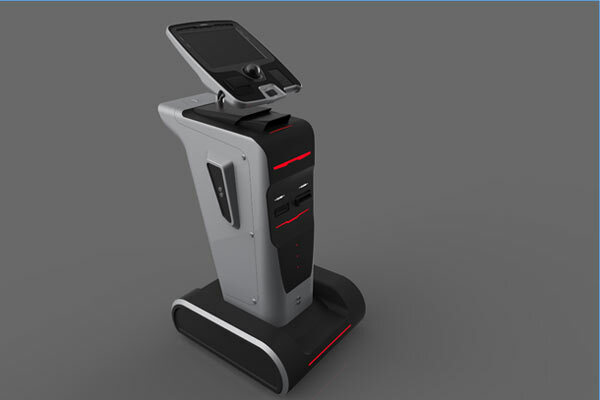 Outfitted with an ultrasonic sensor on each side coupled together with an internal GPS tracker, the R35 is able to maneuver intelligently across the floor and greet patrons to assist them with various tasks. As it is constantly on the move, the R35 is self-reliant where it utilizes rechargeable 12V batteries and safely returns to the charging position when required. It has a standby duration of 48 hours and 12-hour battery life when in constant use. The R35 is also equipped with a keypad with a secure card reader and an in-built printer for receipts amongst other features. It also comes equipped a 12.3” display, ideal for quick assistance via video conference with a customer success officer to attend to patrons in completing their errands, it added. Emerico CEO Francis Lai said: "The conception of the R35 was an incentive at Emerico to further advance and enhance the customer experience in the financial industry. By doing so, this ensures a more seamless and improved customer experience and concurrently saving much storage space." "We strive to be the leading innovators for customer solutions in the ever-changing industry," he added. Emerico is also launching a mobility version customised for the Windows Surface. Previously only available for the iPad, the latest version will provide businesses which uses Windows Surface tablets to further expand into a more integrated ecosystem to interact with their customers and complete transactions on-the-go. This is possible through the implementation of the latest EMV (Europay, Mastercard and Visa) and a fingerprint scanner to ensure compatible and seamless transactions anywhere in the world, said the top official. Among other smart solutions provided by Emerico include the flagship product Emerico Cockpit Smart VTM, the Emerico Smart VTM with iPad which is a more compact version and the Emerico Mobility with iPad for those who are constantly on-the-go, stated Lai.